The Harvard women’s basketball team celebrates after defeating Stanford; that 1998 victory is the only No. 16 seed upset in the history of the NCAA basketball tournament. Looking back over the history of stunning first-round knockouts in the NCAA basketball tournaments, one stands out: In the 1998 women’s tournament, the top-seeded Stanford Cardinal fell to the slightly brighter-shaded but 16th-seeded Harvard Crimson. Now, 17 years later, that’s still the only 16 vs. 1 upset in the history of March Madness. That was the first — and, as of this writing, last — time that a No. 1, 2 or 3 seed has lost an opening game in the women’s tournament since it took a 64-team structure in 1994. Through 21 years and 252 games, the top-3 seeds have a staggering 251-1 record, good for a 99.6 percent win percentage. And that one loss, as Michelle Smith writes on ESPNW this week, came in part because Stanford was down two national-class players. (In Smith’s piece, Alison Seanor, a forward on the Harvard team that beat Stanford, said: “We didn’t have the Internet like we do now. I heard they had one or two players out, but it kind of went in one ear and out the other. After the fact, I remember thinking, ‘Huh, it’s a good thing they didn’t have those players out there.’ ”) Over the same 21-year, 252-game span, the top-3 men’s seeds have 15 losses: five by No. 2 seeds and 10 by No. 3 seeds. No. 1 seeds in the women’s tournament have been much stronger than their competition. Using my own version of SRS (Simple Rating System, a metric that measures margin of victory adjusted for strength of schedule), I found that the typical top seed since 2003 has been a 38-point favorite — and has won by an average of 37 points. A 38-point favorite in basketball typically corresponds to about a 99.9 percent chance of winning a game. For comparison, the average No. 1 seed on the men’s side since 2003 has been a 26-point favorite (winning by an average of 23 points, which is still around a 99 percent chance of winning), and the 1995-96 Chicago Bulls were about 12 points better than their opposition. That’s why it’s so surprising that the No. 16 seed upset happened in the women’s tournament rather than the men’s. 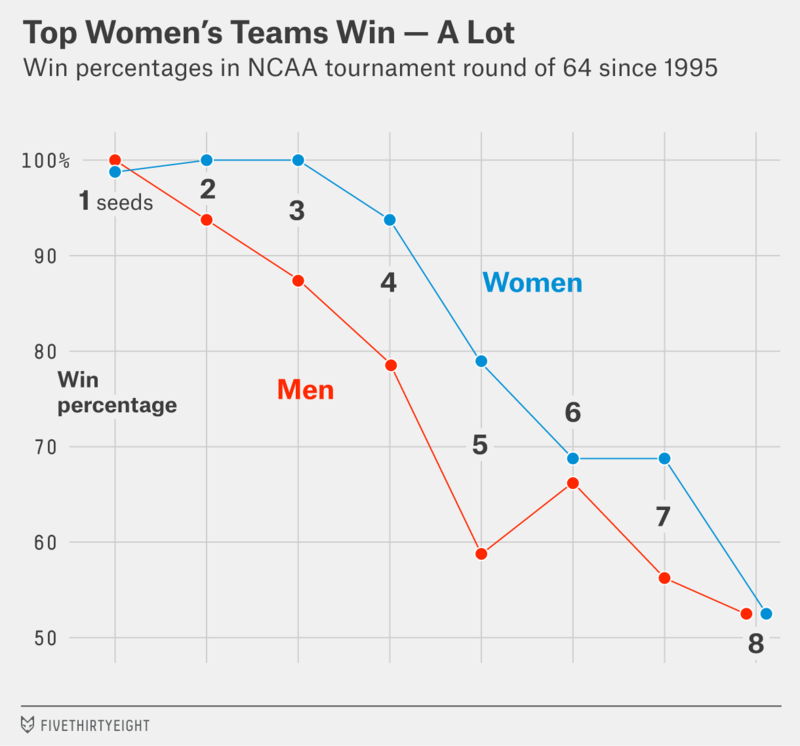 Based on the typical 1 vs. 16 matchups, an upset should be about 10 times more likely on the men’s side — yet it happened in just the fifth year of the 64-team version of the women’s tournament. Stanford’s injuries (which are NOT accounted for in SRS estimates of expectation) had almost everything to do with that, of course. The team had a losing record (2-4) that year without forward Kristin Folkl on the court — even before it fell to Harvard. One thing that could help explain the favorites’ strength in the women’s tournament: Before 2003 (and beginning again this year), the top 16 teams in the tournament — seeds 1 through 4 — all hosted their opening games. Naturally, we’d expect home teams to have a bigger advantage, and that is reflected at least a tiny bit in the results: In the eight years before home games ended, the top four seeds only lost twice (for a rate of one every four years). In the 12 years after, they lost four times (for a rate of once every three years). But if there has been any shift toward parity, it has been almost imperceptibly gradual. Generally, the women’s side isn’t considered to be as deep as the men’s, but that could cut both ways: The top teams may be particularly unstoppable, but the next few tiers might be more susceptible to upsets. (I thought that at first.) But that isn’t the case. Nearly all the better seeds dominate. Top teams in the women’s tournament are relatively stronger going in than they are in the men’s. To show this, I used my version of SRS (based on each team’s games prior to the tournament) for each season going back to 2003 (post-home court era).2 On a neutral court, the difference in SRS between a team and its opponent corresponds to the expected margin of victory, so it’s easy to compare the expected with the actual. On this chart, I’ve plotted the average SRS difference between each team and its opponent (dashed lines) and compared that with the average result (margin of victory/defeat) for each seed’s round-of-64 games (solid lines). The interesting thing here is that the women not only tend to be bigger favorites going into each game than the men but also hew much closer to expectations. That is, they tend to play about as well as they’re expected to play. In the men’s bracket, not so much. It’s unclear exactly why the women’s teams play so much closer to their expected quality than the men’s teams. Perhaps it’s a result of the women’s game being more stable (for obvious example, it features more juniors and seniors). 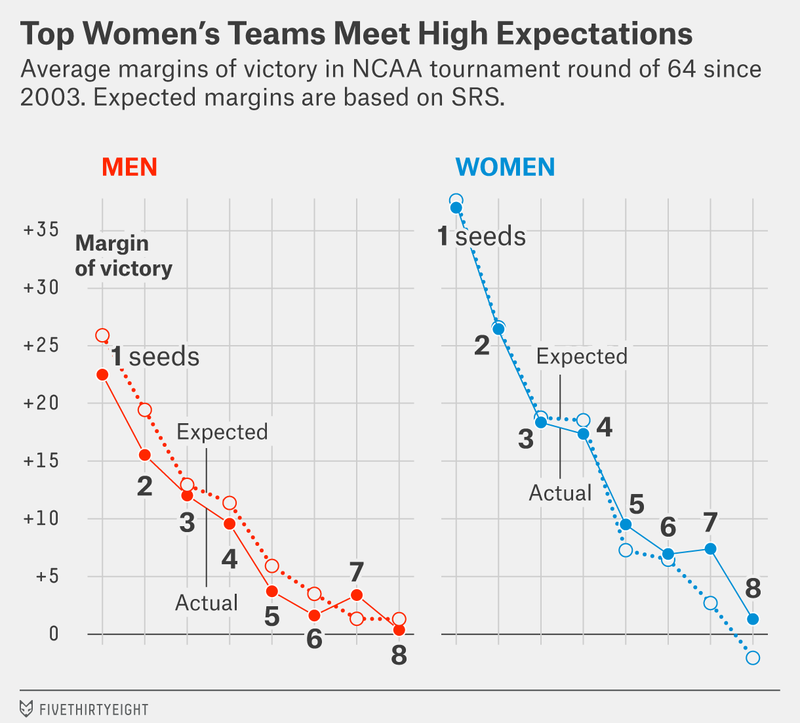 But it seems likely that the perception that the women’s tournament is excessively chalky is at least partly because we’ve come to expect “madness” in our college basketball playoffs. Instead, the women’s tournament offers cool consistency year in and year out. Madness comes only once in awhile. Or ever. Some might argue that when a tournament’s best teams win practically 100 percent of the time, it probably is inviting too many teams. My data only has individual regular-season game results back to 2001.